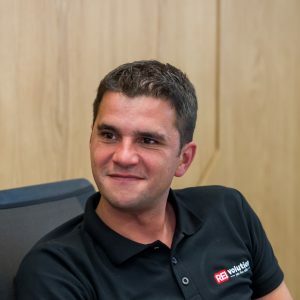 In this Episode we talk to Alex Parge, CEO of REIvolution. REIvolution is a comprehensive Real Estate acquisitions and management system that is used by over a hundred real estate investment businesses across the US. We talk to Alex about his journey with Podio, how they came across the idea to create a product for the real estate market based in Podio and what the main learning has been as they have grown their product. This is a fantastic opportunity to peak behind the curtain of a real estate system and learn about what makes the team tick. Narrator:0:01Get ready for another episode of supercharged with Jordan Samuel Fleming, your weekly dive into the awesome impact workflow and automation you can have on your business when it’s powered by Podio, Join us each week, as we learn from the top Podio partners in the world as we investigate system integrations and add-ons and hear from real business owners who have implemented Podio into their business. Now, join your host, Jordan, Samuel Fleming’s CEO of game changers for this week’s episode. Jordan:0:36Hey everybody. Welcome to this episode of supercharged. I’m your host, Jordan Samuel Fleming. Here to talk all about the power of workflow and automation when you’re businesses powered by Podio. Today’s guest is Alex Parge from REIvolution real estate investment solution built on Podio. Alex, welcome to the podcast, introduce yourself and REIvolution to the audience. Jordan:1:17Great. So, um, whenever I talk to people who have built products for Podio, I’m always curious as to how they first got involved with it because it’s a, you know, it’s, it’s, uh, a platform that has enormous power, but it takes a bit of time to understand that power. So how did you first get started with Podio? What was your first kind of efforts in it? Speaker 3:1:37So it’s quite interesting. Back in 2014, uh, we were searching for a project management platform for our company that we were establishing the software company and we found out Podio and we started using it, seeing the value and then step by step we started building solutions and the first crm built was for another company that we own and step by step people found out and they started requesting us to help them with different systems. So in 2016 we ended up working with the biggest real estate investors from the south Florida, Florida Cash Home Buyers and the, we help them build their solution, improving their setup, and eventually got to the stage where we launched our system based on their experience. Jordan:2:37So you started out, uh, I think a lot of Podio partners and people who build in Podio, you know, you start out looking for something for yourself, you realize the power and then you kind of build from there. And in this case, in terms of real estate, the way you developed a product for real estate was you started working with someone who was really in that industry and did they, realize was a wider opportunity. Did you realize it was wider opportunity? I mean, what was it like to take it from a custom buils to deciding, hey, there’s a, an opportunity for a product here? Alex:3:12Uh, when we initially started working with them, they already had Podio set up. We started making them an audit and showing them what they were missing. A, the thing is that, uh, our partners, they are in a big group of real estate investors that they kind of do the same thing. Buying and selling houses, rehabbing them and when they started showing to others what cool dashboards they have and everything that we have built, basically all the other investors came to us and requested for a solution just like that. They were saying, we want that system, we want a system like that, you know, and the kind of this way it all started, we started working with more and more investors having more and more experienced, uh, and turned out into a product. Alex:4:45For sure. Dashboard is the number one because everybody knows that any number that is tracked, it will be improved. Uh, the second one would be marketing tracking because all of our customers spend quite impressive amounts of money in order to generate leads for the business and the dashboard gives them the ability of seeing where they make profitable investments and where they are losing money when it comes to marketing efforts. Uh, the third thing that would, it’s very appreciated, appreciated by our customers is the fact that the system comes with all the features they would need also on the operational side and uh, when they are trying to sell a property, not necessarily when they are buying one. Alex:5:56Either way. So we also have rehab module where can organize their rehab activities and we help them also to sell the properties. Jordan:6:09Excellent. Now I want to, I don’t know if everybody listened to this podcast really understands dashboarding because Podio is internal dashboarding I would say is limited. So when you’re talking about a dashboarding, um, how do you provide that and, and how does that link up to the Podio system itself? That’s clearly, that’s something that you do external to Podio, is that correct? Alex:6:33Correct. We have our own dashboard platform and through our servers we, we gather the data from all over the system from different apps and we are able to compute different averages or KPIs, things that are not possible in Podio where you are able to pull out reports from different apps. Also, when we designed the system, uh, we have made, we have made it in order to be able to pull as many KPIs as possible. And that’s it. Jordan:7:10So your customers can, you provide a standard set of sort of dashboards, but they can also obviously customize them to pretty much, you know, my rule of thumb is if the data’s in Podio, we can use it, we can do something with it. Is, is that pretty much what you’re offering to the customers? Alex:7:28For sure, for sure. Uh, even though we are offering them five dashboards, so I guess more than 50 Kpis, it’s hard to wish for others, but our customers don’t hesitate to surprise, surprise us and always looking and searching for, for other things. Jordan:7:51So when did REIvolution launch and, uh, where are you to date in terms of like, you know, customers who are, who are, you don’t have to give me exact number, but customers are using it or the different product levels that you have. Can you give us a little description around that? Alex:8:08So, uh, I can say that an official launch was in December 2016 when we launched the pro version of our product. Another launch was in March 2015 when we launched the light version that it’s more simple version for, for our customers. And the, we ended 2018 with more than 100 customers, uh, both on light or pro versions of our product. A very recently we have launched an add-on marketplace and we redesigned our price structure. Basically, our customers receive the out of the box solution, uh, in the light version and afterwards they have the ability of inserting pro modules or adding different dashboards to their setup in case they, uh, they need it. Jordan:9:03Okay. I mean, that’s a, that’s, that’s really interesting that you’ve got the, the sort of light version and the pro versions. I’m, one of the things that I’ve found over the years of integrating Podio into people’s businesses is, is the, the challenge of getting people, you know, uh, migrated over to a new system. How do you manage that, you know, uh, in a fast paced business like real estate. How do you manage that, that migration of people into your tool? Alex:9:34Oh, this is always a sensitive subject when, uh, when we are discussing with teams. Because normally a, the first layer of communication is the owner of the business that is always proactive and wants the cutting edge technology, but you end up talking with a 12-year employee that let’s say over 50 years old and they, they feel something they are not very comfortable when they need to change, but we are ready to support our customers. We have a knowledge base, a documentation that we offered them with more than 100 videos and training materials from where they can inspire a, we also have built some sort of academy where they can enroll in the courses and make a assignment in order to learn how to use it. And the lastly, we also offer one on one training training meetings where we answered their questions and n the end we make their life easier. Alex:11:28here? I can say about the mixture of reasons, uh, one would be the fact that Podio was there and we have focused on building our communication hub around Podio because what we have managed to do in our REIvolution was to integrate all communication channels in the platform. And we are talking about the phone system, uh, that now REIvolution comes with smrtphone, the, the first, uh, Podio phone system, especially for Podio phone system. Then we have integrated the emails inside our platform, ringless voicemails, text messages, uh, and with that we have covered all the aspects around the communication because all we do as human beings all day long, we communicate among ourselves. If you add dashboards to that, if you track your performance while communicating. And I would give us an example response time. No, if you, if you manage to track it in Podio, then you have a powerful tool. Sure. That you can use. Sure. Jordan:12:40And I mean, you mentioned smrtphone. Obviously the, the people listening to the podcast will know that I’m a co-director smartphone with you. So, uh, there is a bias here that I think it’s also the best system out there designed with that question. But I mean, it’s been interesting. I think it’s been fascinating for me as we’ve developed smrtphone together in that real estate environment to see just how important phone and SMS is for certain business models. Um, you know, some business models are very email focused, meeting focused on real estate in particular is uh, is huge phone and SMS focus. Um, so when you’re talking about maybe integrating communications in with REIvolution and say let’s look at text messaging or I assume then you are um, doing followup sequences embedded into the system so that they can test out what works and what doesn’t and automatically send a SMS is out to, to not drop the ball. Is that correct? Alex:13:44Correct. We have a system called no lead left behind. It’s also in our core, REIvolution lights system, a system. Our clients are able to set up followup campaigns, either we are calling about a, are talking about giving a calls, sending automatic text messages, ringless voicemails and the or email messages to their customers. And very recently we have also a integrated direct mailing in our sequences processing in REIvolution. This is something that everybody wants and everybody searches for this kind of solution because nowadays it’s kind of easier to get the leads if you, if you have the budget of obtaining them. But what most people see is that the conversion rate from a lead to a customer is quite low. So their main focus is to improve this, this KPI, and in order to take care of say 1000 leads, you need manpower with REIvolution, you have all the manpower, you need to treat as many, as many leads as you as you want. And the system gives the ability of your team to only focus on those lists that really are really interested and they are answering your messages when that are being, that are being sent in regards to the content because the system comes with the functionality but not necessarily with the content because in the end the content makes the difference. We are also offering a one year and a half content, uh, for customers that are interested written by Gabriel Garcia from Florida Cash Home Buyers. It’s a, it’s an always updating content because he always adapt the contact to the customer needs. Jordan:15:49Okay. That’s interesting because I don’t, I do think that content, I mean content is always critical. Um, you know, content is the difference between someone reacting and feeling like they want to engage and someone just throwing something away or, or, or deleting a message, but when it comes to, um, you know, you were, you were just talking a bit about the sequencing and, and, and about getting this, letting the system focus you on what the people who are engaging. So if we think of a traditional sales funnel, what we’re really saying and what you’re really saying is that REIvolution is trying to set up the opportunity to allow the system to deal with the top end of the funnel where we don’t really, you know, we’re, we’re, it’s all cold and we’re not sure if how, how interested they are. So you don’t want to waste manpower, but as we know that they’re engaging and the funnel is closing down, that’s when the system can push it to actual people so that you’re maximizing your people. Is that a fair way of looking at it? Alex:16:56Yes, definitely, definitely. It’s really interesting with the conversion funnel that you have mentioned because a combined with the marketing analyze stool and the kpis that we are offering, a anyone can really reverse engineer, re-engineer their, their business. Basically, you can start from your goal, the profit that you want to obtain. Then you see how much it costs you to obtain a lead and from the bottom of the conversion funnel, where do you see how many leads you need in order to close the deal? Then you, it’s a simple math to see exactly how many leads do you actually need in order to obtain your, your target. And as you said, the first level of the funnel, the leads that are coming to the system, uh, that’s the biggest baseline of customers that needs to be treated professionally and very, very fast. From that point. The system also helps on the other phases. Let’s say when you have an appointment book, then maybe you want some flows that will remind the customers they have an appointment with you. Uh, you have some flows that will, uh, remind the acquisition rep they have an appointment to go. Uh, they are providing all the details regarding the transaction, the property they are going to visit, they are able to to gather notes on the meeting. Uh, they even have the ability, if they find the client that wants to sign the contract on the spot, they are able from the phone to generate the contract and to, to send to the customer directly by email or through electronic signature so they can close the deal at that meeting. I think that will improve their performance. Jordan:18:53Sure. I mean, I think the, the capability of the Podio ecosystem to drive that kind of workflow is, you know, is so critical and, and we know how to, you know, we all know how to do that in Podio. So your ability to replicate that and customize it quickly for customers is, I think it’s got to be one of the greatest reasons why REIvolution is successful in Podio is that replication and customization element, right? I mean, do you. So I assume then that everybody has control in their own system as to the manner and know the setup in terms of reminders or, or, or what sort of, um, uh, you know, uh, sequencing, they’re using. Alex:19:40Sure. Uh, we are installing REIvolution on client’s organization so they are able to build anything extra on top of our system, uh, with our test templates system that was designed in order to give a tool for people to build the SOP to task management. Everybody, we give some examples but everybody can build their own procedures. Um, then you would have on the sequence side, you can create as many sequences, as many campaigns as you want. You are not tied to our company. Jordan:20:25Sure. And talk to me a bit about the different levels of REIvolution that you’ve got, um, you know, in terms of price point and in terms of who is is using it and why, you know, uh, you know, what type of company is focused on, on the different ones if you know that. Alex:20:44So we have three price versions light is suitable for any real estate investing company that can be run by, let’s say only the owner, uh, it’s perfect for them to start. It’s easy to, to bring, let’s say virtual assistants to who to help you in your day to day activity. And uh, so that will be a subscription only based on price model. Then we have the PRO, and the pro add-ons. Some of them, uh, have an implementation fee because you cannot do everything automatically. You need to work at some point. So that’s why, uh, some of the modules like Rehab or advanced marketing dashboards, human resources, financial tracking, those can be installed when needed and some of them have a price attached to them. We usually, we usually recommend people to use the pro version if they do at least 20 transactions per year or they are committed on spending at least 50k a marketing budget per year and have a team of at least five employees because otherwise it doesn’t make any sense. It’s easier to start with the light version. And then once you grow and your company starts to grow, everything gets more complex and you need more accountability and then it’s suitable for you to install the pro version. If we talk about the elite version of our software, then we talk about very big companies, a different markets, maybe teams, uh, about 50 people working for them. Uh, and there we discuss about a custom setups. We start with an audit, we see the requirements, we give solutions. Um, we analyze three times and then we execute once, let’s say, in order to make sure we are doing and implementing the right solution for our customers. Jordan:23:13No, I mean, if I think about this as a very base and because I, I understand what you’re, you know, the type of market you’re in, at the elite level. It’s a partnership between you and them in, in, in much, much greater way in the sense that you are, um, you know, your, they’re heavily investing in your system and you are heavily investing time to make sure that it is custom built for them. At the light level, it is an entryway, a providing a really strong tool set for your sort of smaller business or you’re a, you, your, your, your younger business or business focused on a certain type of work. And then the pro version is a really good sort of transition product is really good product where you’re at that level where you’re larger, you’re doing rehabs, you’re trying to track all this stuff and uh, but you’re not quite at the maybe multiple markets and uh, you know, you’re not quite, you’re not quite taken over the world yet. Is that kind of fair? Alex:24:15yes and no because, uh, you have the ability of working on multiple markets. In REIvolution pro, when I was thinking about an elite customers dealing with multiple markets is the multiple team teams is when you have a system that has a central workspace and market workspaces, beloe, and then you have teams that have access only to specific workspaces and you have synchronization workflows. And of course, you’re talking about the partnership when, when you discussed with the customers and with the customer and you both agree that your collaboration will take at least six months, uh, that they will have a dedicated person in your team that will know everything about their project when you have weekly meetings, weekly project meetings to see what has been done, what needs to be done next week, what are the priorities? Uh, sometimes we recommend something they say to us, no, we are going to do this because it’s more important than definitely it’s a partnership. It’s a partnership there in regards to going from light to pro, uh, as you said, the client, I guess the client a has to fill the need of something more complex. If they don’t feel the need, then it’s not for them. Let’s say the same thing. It’s with the elite version. Jordan:25:44The first is the need of the client for sure. That, that makes sense. And I assume that, you know, I’m, one of the challenges I always see think of in terms of Podio is um, you know, there’s always a, a, as we talked earlier, the integration challenge of getting a team working on it. And so, uh, you know, sometimes less is more to get people started, you know, sometimes you just get needed to get people started and get people moving in it and then once their understanding of how to work in the system increases, you can increase what they can do in it. And I assume that could also be a time where, you know, you start with something like, right, REIvolution lights are work on that for a year and really get comfortable and then realize I have an opportunity to run my business better by engaging rehabs, you know, by, by tracking our rehab stuff in here or by doing other bits like that. I assume that could be a path as well. For sure. For sure. Alex:26:41That’s a path always. And the you, you mentioned we have bought some for customers decide to keep all their email communications inside Podio. Okay. And that’s an important step to, for a company when you are switching from, let’s say, 10 different inboxes, a that only those persons will see and you start putting them for everybody to see and collaborate on email communication, let’s say all sorts of examples that the and improvements way that we offered our customers. Sure. Jordan:27:20I mean, presumably the, the market for this product for REIvolution is, um, is very much a US based market. Alex:27:29Yes, it’s entirely for the US market and for the real estate investment companies. Jordan:27:35Excellent. So, um, just as we close out, I’m obviously, I’m going to put in the, um, a website address into the podcast notes so people can quickly find it if they’re, if they’re listening to this and, and wanting to learn more. Um, but, uh, you know, do you have any, uh, anything planned coming up, any new things, any, anything that you’re working on now that you can sort of tease people with, uh, anything that you find exciting coming down the line? Alex:28:04As I was saying at the beginning of our conversation, we have just launched the add-on marketplace and a newly and redesign the customer experience with our platform now when they are joining us, the recieve on accounting in our app where they are free to configure and activate and deactivate modules that they want. We are constantly building new integration based on what customers are requesting, what the market in the end, what the market is requesting. And the one thing that, uh, we have just launched, but it’s again, one of our products is the dialer smrtDialer, dialer capabilities, uh, that will give our customers the ability of improving their activities like cold calling because lots of them, they have lists of possible leads, they want to call them fast and efficient. So now we have officially integrated our system also with REIvolution and we provide support to our customers on how to set up. Another aspect of the business is the skip tracing activities, uh, that we see lots of customers are performing. And again, the dialer improves their efficiency. Uh, we have built the built. We have a, let’s say, establish procedures also for the existing leads to be managed through the dialer. And uh, we have very good feedback from our customers. Justin was saying, uh, so look, I had this list of no contact leads, so leads that they weren’t able to get into contact with them. So you come, you configured my, my no contact list in the dialer in one hour and a half we had the new deal and that simple, you know, simple and one new deal in this sort of environment is worth a lot of money. I mean, it’s potentially a lot of cash if you track your average profit per deal and you want to improve it. Yeah, it can be, it can be a lot of money. Depends on how you run your business. Of course. Jordan:30:31Well, I suspect, uh, we’re going to be doing at least one if not two episodes of this podcast directly. I’m focused on smrtphone and smrtdialer, um, because, uh, it’s, it’s certainly a tool I know that a lot of the partners are implementing into their clients. And I know, you know, we’re selfishly, you and I are co owners of it, so I’m allowed to push it without question, but Alex, look, it’s been fantastic to, to understand, I know that, you know, um, people listening here, you know, Podio has become a real standard for the real estate industry. It’s probably, I would say it’s got better penetration into the real estate market than, than almost any other sector in terms of being an accepted standard. Um, so to see you guys, um, and to understand more about your product and to give people that opportunity is fantastic. I appreciate you taking the time. Uh, everybody are we posting the, um, REIvolution website link on the podcast page and on the podcast itself so you can go to it quickly and don’t hesitate to go over, uh, in Podio and connect with them. Uh, you know, the great guys and I’m sure there’ll be delighted to show you more. So, Alex, thanks so much for joining us. Narrator:31:42You’ve been listening to a supercharged with Jordan Samuel Fleming. Subscribe today on Itunes, Google play or spotify for your weekly dive into how you can supercharge your business by making it powered by Podio. Be sure to check out our website. 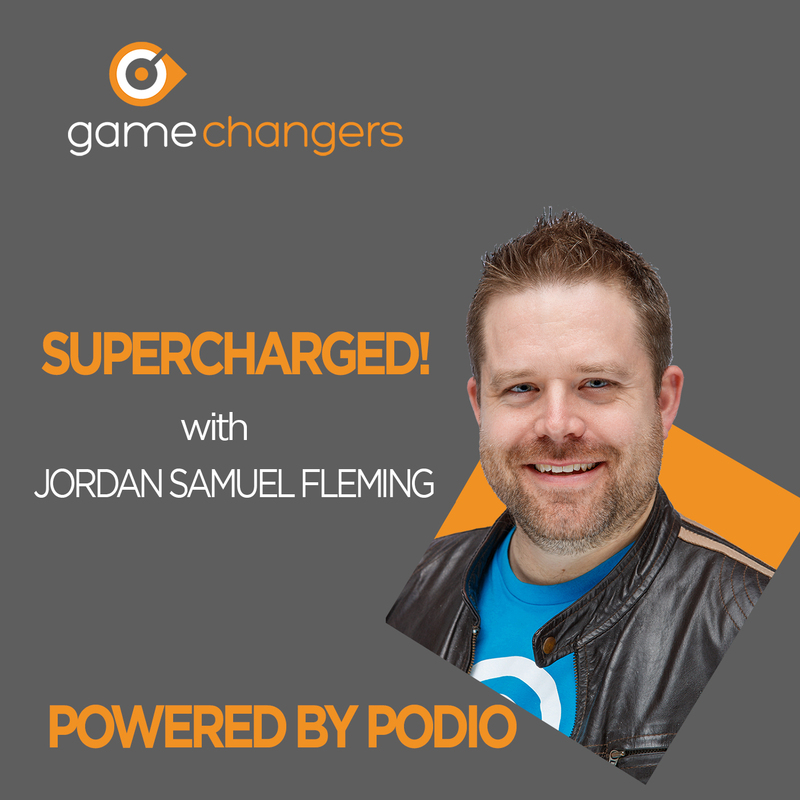 www.wearegamechangers.com where you can learn more and arrange a 30 minute call with Jordan to help you understand how Podio supercharges you.